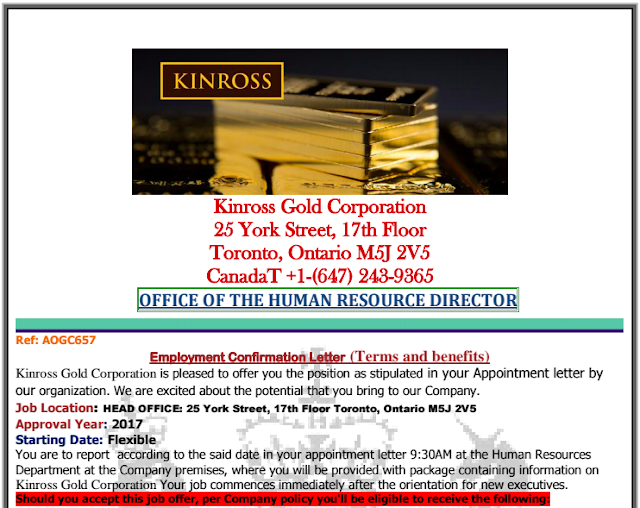 SCAM ALERT: Kinross Gold Corporation - Gateway to Canada | Canada Immigration Consultancy! If you received a letter form Kinross Gold Corporation informing you that you are hired and that you need to send the appointment letter together with your passport and other documents to a barrister at Canada Border Service Agency to get your visa or work permit, don't get excited. KINROSS MINING CORPORATION APPOINTMENT LETTER SOFT COPY- KINROSS MINING CORPORATION LTD JOB CONTRACT DETAILS. The Human Resources Department of Kinross Gold Corporation Office wish to inform you that your application CV has been properly Reviewed with your Submitted details. Your Name has been considered for employment with our Company as one of our new employees who has successfully passed the Email Interview as it was expected. Your qualification experience and eligibility to work in our company has been confirmed by Kinross Gold Corporation office Management. So you are expected to get all your traveling documents ready through the assistance of our zonal coordinator on traveling Visa fast approval, who is a senior officer working with Canada Border Service Agency Canada You are to contact our CBSA Barrister in Canada because of the express traveling approval of Working Visa documents, considering the documents that you may be required to present before the Canada Border Service Agency Canada and the nature of interview that you might face, the time and Visa delay, which might not be all that favorable to you, thereby resulting to refusal of the visa to you. We therefore decided to establish a responsible cordial relationship with Barrister White Lawrence J in the CBSA for fast approval of Work Visa to our selected applicants without delay and long visa protocol. Note: That the entire traveling documents and formalities required by you should be obtained from the Canada Border Service Agency Canada in Canada before directives will be giving to Canadian Embassy in your country for visa endorsement, according to the company's management schedules. Now you have to send this Intent Appointment Letter, international passport, one photo passport to the Respected Barrister at the Canada Border Service Agency Canada via e-mail: whitelawrence@cbsatravel.esy.es for endorsement of your visa in the Canadian High Commission in your country after your visa is approved by the Canada Border Service Agency Canada. This will prove that you are our employee and all necessary help should be availed to you. Please when coming to Canada to assume office, you are to come with your hard copies of your educational qualification. Kindly find the attached document soft copy of Intent Appointment letter in this mail. Your documents have been submitted to the Canada Border Service Agency in Canada for further processing. Your file will be open by the Barrister in CBSA office in Canada on your behalf for the Visa process. As it was stated in the appointment letter soft copy; (a) you are to take responsibility for your ICC fees. (b) That the Company will pay for your flight ticket to Canada after your Visa is approved (c) The Company will refund the Visa processing ICC to serious applicants that are able to travel to Canada. (d) The Company will not initially take responsibility for your ICC fees as we do not want to waste company money on applicants that are not actually prepared to travel abroad even after the Visa has been approved to them. CANADA BORDER SERVICE AGENCY (CANADA) OTTAWA, ONTARIO. Please Endeavor to update us on your successful processes with them for liaison purpose and scan copy of your Visa page as soon as your Visa is stamped to enable my office book for your flight ticket to Canada for your resumption of duty as stated in your appointment letter. Do call the barrister on phone +1(647)6941472 immediately you send him an email for procedures. Information about Canada Visa Application is available for free at http://cic.gc.ca. To apply for a Work Visa, you need a valid job offer from Canadian Employer. A valid job offer is one that was approved by HRSDC. You must have a positive Labor Market Impact Assessment (LMIA) as a document to support the validity of your job offer.